As most North Carolinians enjoyed the end of campaign attack ads and basked in above-average temperatures on Christmas Day, a political storm continued to churn in Raleigh. Democratic Gov.-elect Roy Cooper, before even taking office, has been swept up in crosswinds along with the veto-proof Republican majority in the state legislature. A deal Cooper helped broker for the repeal of House Bill 2 collapsed, leaving both sides bitter. 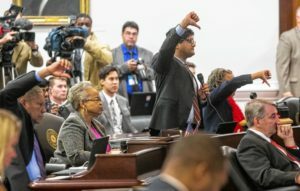 Another longtime Democratic strategist in the Tar Heel State, Gary Pearce, said the failure to repeal HB2 is evidence of a divided Republican Party in the state, and revealed pressure points Democrats might use to defeat them in the future. Republicans are determined to stick with a conservative agenda they say has produced one of the top economic recoveries in the nation. Cooper, who defeated GOP Gov. Pat McCrory by just 10,000 votes, has vowed to keep his campaign pledge to shift what he believes is the rightward course of the state. The HB2 repeal fiasco was not a good jumping off point for the governor-elect. “My future negotiations with them (Republicans) are certainly going to have to be instructed by this (HB2),” an angry Cooper told reporters last week after the deal to repeal the law known nationally as the “bathroom bill” fell apart.